Often you may need cash quick, as in today, don't have the time to go into the bank or loan company. 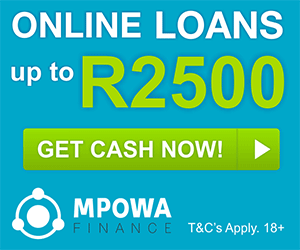 MPOWA Finance is here to help and offers simple, fast online cash loans in RSA of up to R2,500. Application couldn't be easier and can be completed online in just a few minutes even with bad credit or if blacklisted. If you have the correct documents and can send them via fax or upload over the internet your loan could be paid to you the same day during business hours. Payday loans (also referred to as same day loans and cash advance loans) are small cash loan amounts that are generally repaid in a single payment on the date that you are next paid. This means you are not stuck in a long term loan contract and also means that you do not have to go into the bank or loan company to apply as everything is done online the same day.